I had such a great time at my first Wizard World Comicon! Thank you to everyone that came out and said hello and made me feel welcome! I had some fun and interesting commissions. I had the honor of sitting next to an animation legend! Tom Cook animated so many cartoons from my childhood, from He-Man and She-Ra to Tiny Toons and Scooby Doo. I got to see the amazement and childlike wonder of so many people meeting a man that shaped their little lives. 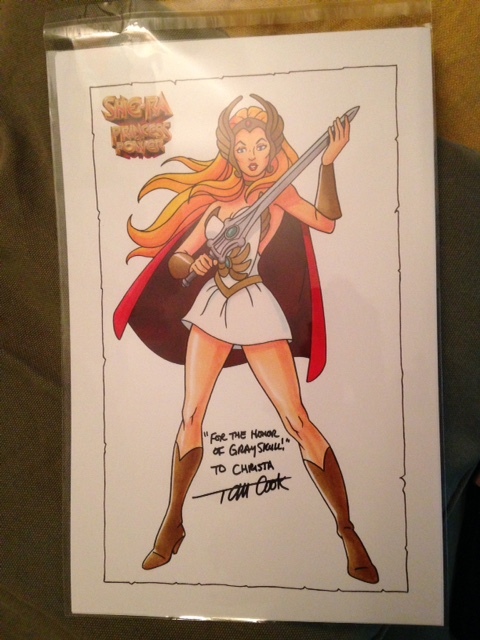 I also got a signed print of the woman herself, She-Ra to hang in my art space! I had all of the toys, She-Ra and He-Man. I had the weird fuzzy Battlecat for He-Man to ride on, but truth be told I had Shr-Ra ride him more often. So don’t be surprised if you see some new works from me that are inspired by these series! !